Learning how to digitize for embroidery requires time, dedication and patience. When acquiring a new skill, we all start from the bottom and move step by step upwards on the success ladder. The one who practices with dedication surely reaches the top and reaps great rewards. You have to keep your cool when learning something new. Learning how to digitize for embroidery can be engaging, practical and informative. It’s not just about using some software. Familiarity with various models and makes of machines, type of file formats they accept is learned. Experimenting with a variety of materials yields diversity in results. Eventually, you’ll be accustomed to the limitations and discover your niche. Sky is the limit. I started learning out of curiosity and then became hooked on to it. It became my hobby which then became my passion, and finally my profession. Coming home from school, I would spend hours on my computer researching and learning new things related to this newly discovered hobby. I would then try to replicate what I had just learned. I faced failure many times but never accepted defeat, it was my dedication that kept me motivated. Why didn’t I quit? I am not into science, numbers or games. I am an artist and wanted my artwork to become universal, something I could carry around with pride. Hence, I decided to turn my artwork into embroidery. I had my eye on the grand prize, to be a master embroidery digitizer. I began downloading free designs from the internet, they were of low quality but that bother me, I needed designs to practice upon. When I started, I didn’t realize that design quality matters. I thought I was ready to be practical and started on an art to stitch software. Soon after making 3 designs I headed to the embroidery machine and hit the start button to see my work on fabric. It was a mess, broken threads and needles, puckered cloth everywhere. I realized two mistakes, first of all, my materials lacked quality and secondly, embroidery digitizing isn’t something that can be done on auto-pilot. It needs to be done manually. The results were bad, I concluded that my materials weren’t good enough and I went shopping for better quality stuff. It soon dawned upon me (after wasting a lot of money on supplies) that the designs I had chosen were unfit for the task. Note: Never use low-quality designs even if they are for free. Always get your designs from reputable sources. Embroidery is a lot tougher than it looks. Take a closer look at the beautiful designs available in the market, you will notice a coarse set of stitches before the top stitches. These are the underlay stitches used to control fabric. Embroidering directly on woven fabric can be an uphill task. Fabrics stretch, shrink and even rip apart under the machine. Knits are even worse and may ruin your work entirely. Most fabrics are impossible to work upon and that is why you need to provide support from underneath with a ‘stabilizer’. It is a non-woven fabric like material made of fibers randomly aligned to prevent stretching. You need to know about the qualities of fabric too when designing. There are certain types of fabrics that may not need a lot of care such as towels. But for fabrics used to make dresses, knowing the tension they can withstand is crucial. Machines are programmed to work in a fixed pattern, they cannot make their own decisions. 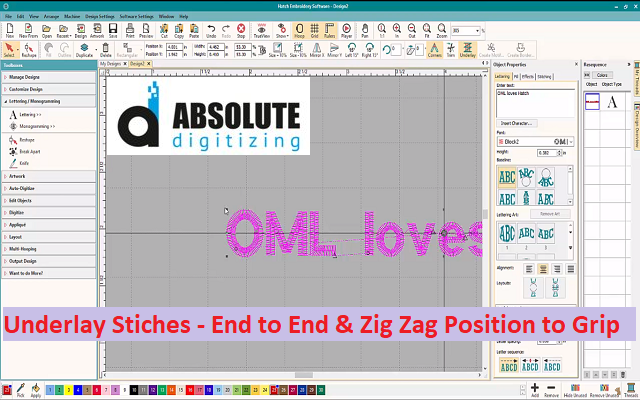 As a digital embroiderer, it is your duty to come up with an accurate stitch order. Think of it as a road map, it is a path the machine would follow and work without obstructions. In your head, define the movement of the thread in the perfect way that covers over itself, includes positional adjustments to counterbalance how the fabric has moved. The best approach is to sew from outside to inside because fabrics tend to shrink when embroidered. Do not try to get it all done in one go. Break the design into smaller parts and stop your machine from time to time to see if everything is going according to the plan. Always put the underlay when needed, it can save you from a lot of troubles. It’s the one thing that I learned the hard way, never go cheap on your materials. Quality has a huge impact on results. Quality speaks for itself. When I began embroidering on my Janome machine I bought the cheapest threads so that I could buy all the colors. Surely I got them all at a huge bargain, but the threads broke so much it was impossible to get a decent finish. There’s no way to hide where the thread broke off, the outcome was heartbreaking. I learned from my mistakes and now use Madeira which is strong and helps produce high-quality results along with Schmetz needles. I would advise you not to compromise on thread quality, never even think about buying low-quality needles, these small savings aren’t helpful at all. Embroidery digitizing or applying embroidery on fabric are two different tasks. Both have their complexities and can be overwhelming when you’ve just started. You need to know your choices and what suits your interest. If you don’t like to use a software but prefer to work with embroidery machines, it is fine because you can use the services of Online Embroidery Digitizers. You can let the professionals do the hard work of brainstorming the roadmaps for the machines. You can benefit from their services by using perfectly designed files ready to be uploaded in the machine and get your fabric embroidered. If you are looking for a reliable embroidery digitising service you can contact us for your custom digitizing requirements. 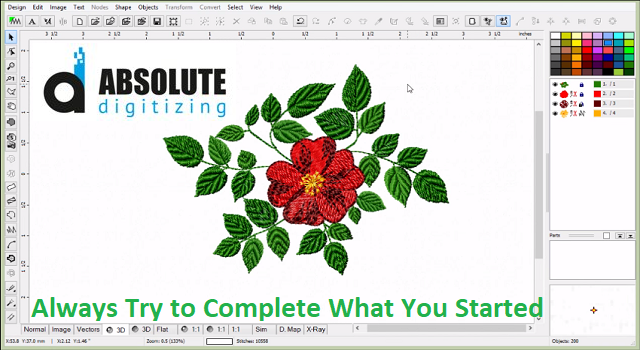 Absolute Digitizing offers a fast turnaround time with free editing and affordable pricing for your logo digitising jobs.